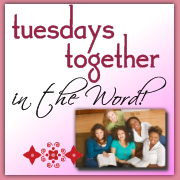 Welcome to TUESDAYS TOGETHER (in the WORD). I am so glad that you have joined us. Our goal/purpose is that we are reading God's Word and we are sharing with each other a "nugget" of what we are learning. Join with us - at any time. We welcome your comments and/or your thoughts of what you have read and/or your link to your blog post. You do not have to be a "blogger" to join in on the encouragement and sharing together. This week our reading (as posted on the sidebar under the button) was from I Peter 2-5; Psalm 38; 2 Peter 1.
told you about the power and coming of our Lord Jesus Christ, but we were eyewitnesses of his majesty. For he received honor and glory from God the Father when the voice came to him from the Majestic Glory, saying, "This is my Son, whom I love; with him I am well pleased." We ourselves heard this voice that came from heaven when we were with him on the sacred mountain. This account is also recorded in Matthew 17:5, Mark 9:7, and Luke 9:35. In each of these passages, we are told God said, "This is my son, whom I love; with him I am well pleased. LISTEN TO HIM!" The Voice of God is heard... Do you know who this is? It is my Son. I love Him and I am pleased with Him. Will you just quit talking and Listen to HIM? Maybe it is often the same way with us in our prayer/study times. We get so busy talking that we do not take the time to listen. Often we even try to tell God how to handle situations. Like He needs our ideas. I wonder how often He speaks to us and says, "Will you just quit talking for a while and listen?" A few days ago, while keeping our almost 3 year old granddaughter, it was getting late and she really needed to go to bed. I have learned to give a little warning that her play time is almost up and that soon we will be going upstairs. I was telling her, "Aubrey, it is almost time to go and put our pajamas on and read our books and sing our songs and go to bed." "Aubrey, did you hear MommaDee?" "Aubrey, you have just a few more minutes...."
She turned around from playing... walked halfway across the room, put her little hands up (like to motion stop) and very politely but firmly said to me, "No More Words". I have been thinking about this alot lately when I have sat to read the Word of God and pray. I really believe I need to quit talking so much... and listen. Realize that I am in the presence of the Great I AM... Maybe I just need some time with NO MORE WORDS. "Speak Lord, for your servant listens." Remember... leave a comment... share your thoughts... and if you blog - link with us. Also, please post a link back here so that others can come and read the other Tuesdays Together posts. You can use the button on the side bar if you would like. Sometimes we like to talk and talk and even tell God what to do, don't we! Thanks for the inspiration! Have a Blessed Tuesday Together! God speaks in His still, small voice and if we are not careful, we will talk the loudest and not hear our Lord. We need to be quick to listen...slow to speak. How often must God say that to us?! I loved this nugget, DeeDee! Thanks so much for sharing and leading us in these readings! Aren't grandbabies just the most precious! No more words- too funny! My son told me just this week that "I ask too many questions." I did not find his comment near as cute as your granddaughter's comment. Speaking of that- I hate I missed the "In Your Face Class" tonight. I could not make it tonight. Thanks for the great post. Dee Dee, I think we often speak when we should be listening. Thanks for this visual. I could picture your granddaughter holding up her little hand, and saying "No more words!" Don't ya know that sometimes God probably wants to hush us like this too,...and just say, "Listen". I hope I will remember this, and listen more to God,...and also in my relationships with people! I want to be a good listener. Hi DeeDee ~ Thanks for your comment and for visiting my blog! I LOVE yours! How cute! Hey, and I'm your 100th follower!! Woo hoo! I just added the "follower" thingy to my blog and I have one whole person so far - which doesn't really count because it's my husband and I added him myself. Sigh. But above all... I hope that "the words of my mouth and the meditations of my heart are acceptable in Thy Sight, Oh Lord, my strength and my Redeemer." "Thy Word have I hid in My Heart"
IT'S FRIDAY.... BUT SUNDAY IS COMING!